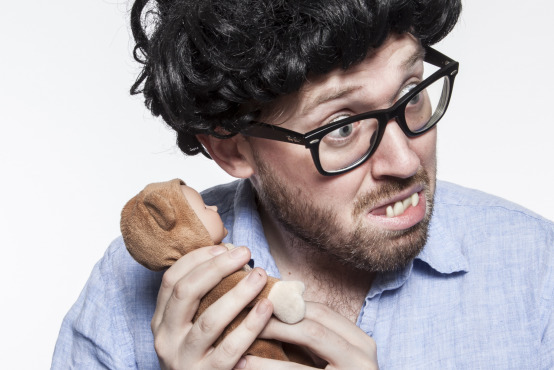 This month’s Comedian Of The Month is the strange character comic, John Kearns. Winning Best Newcomer at the 2013 Foster’s Comedy Awards and following that up with the 2014 Foster’s Edinburgh Comedy Award saw Kearns make history and he has continued to blossom ever since. With tousled wig and oversized, crooked false teeth, this comedian really epitomises what might be considered “niche” in the comedy world, being, in his own words, “a joke that got out of hand”. Talking of John Kearns, Bruce Dessau (Beyond The Joke) recently said “this work is very much for people who see a lot of comedy and crave something with a stronger flavour,” so perhaps this explains why I am such a fan of Kearns’ surreal comedy, but I’m not quite sure that’s it. I can also see how he could potentially appeal to a much larger audience, spanning over all ages, as he can certainly be compared to the likes of Harry Hill and Reeves and Mortimer, who have charmed adults and children alike for decades. The absurdity borders on tragic at times, which makes for truly interesting viewing, and this is balanced by relatively frequent and astute observations derived from the simplest of things, like “I saw a five-year-old wearing a watch,” which earns a laugh in itself but is then developed even further. With his childish mannerisms and lively delivery, John Kearns really puts the joy into stand up. It is a pleasure to see him on stage as he clearly has a lot of fun, as well as bringing an enthusiasm to his performances which can only be admired. Helen Duff is a comedian who specialises in clowning, and she has a lot of exciting things going on this year, from getting to the final of Amused Moose New Act Awards 2017 to starring in the film Holmes and Watson, due to be released next year. Helen will be performing her new show When The Going Gets Duff at Assembly Roxy throughout August. So much! I’m a one woman adrenaline sluice when it comes to the Fringe; my body’s on red alert as soon as I smell buttery hops on the air. This year I’m backing myself to take some big risks with free form movement, weaving it through my anecdotes to make my body a more explicit part of the conversation. 2) What was is your Edinburgh show about? It’s a real tapestry of experiences, all tied together around the tantric shaman that I went to see at the beginning of this year and the ways in which that sparked my synapses. Also, I do a bit of swimming through slippery fish. I really like the variety of my audiences. I get them involved because I think it’s a waste of a live performance to pretend they’re not present, and I’m not interested/confident/contained enough in myself to sustain a show without their occasional input. I once walked past a mattress abandoned next to some bins and felt it would be better than the student theatre flat I was living in with 6 to each room and a microwave that must have been a masochist. I feel very lucky to get to do comedy, it’s helped me feel much happier in myself and I’ve met some really inspiring sorts – like the Weirdo’s comedy collective held together by the endlessly inventive Adam Larter, who has a show at Heroes of The Fringe, and Ben Target, also at Heroes, who makes my mind smile (as well as my face). John Kearns is a master and I want to shake my legs to get the laughter out when I see his shows. I’m through to the Amused Moose New Act of the year competition on the 14th, and I have no idea how I got this far, so it already feels like I’ve made a massive leap. I would be happy to make a fool of myself in the final, just as long as it’s in a way that other people enjoy. My goodness! I would love to plunge my fists into two pots of paint in an entirely white room, with white walls, a white shag carpet and a white Dulux dog, throwing the paint about in artful arcs and wobbles, maybe there’s some music playing – I’m sure by then I’ll know a fiery classical track. Each audience member gets a thin paintbrush and a part of the wall, then they make the beautiful mess into a story with whatever they weave in between. I wonder if we could find a new space to paint for every show?